It looks like HBO is jumping on the murder bandwagon with their new documentary series, The Case against Adnan Syed. The docuseries is based on Serial, the podcast that took a closer look at the case of Adnan Syed and his murder conviction of his ex-girlfriend, Hae Min Lee. Who is Adnan Syed? Did he really kill Hae Min Lee back in 1999? With so many on the fence about whether or not he did it, the details of Syed’s case continues to enthrall (and baffle) people. We hope our Adnan Syed wiki can provide some insight. Adnan Syed Wiki: Who Is Hae Min Lee’s Convicted Killer? 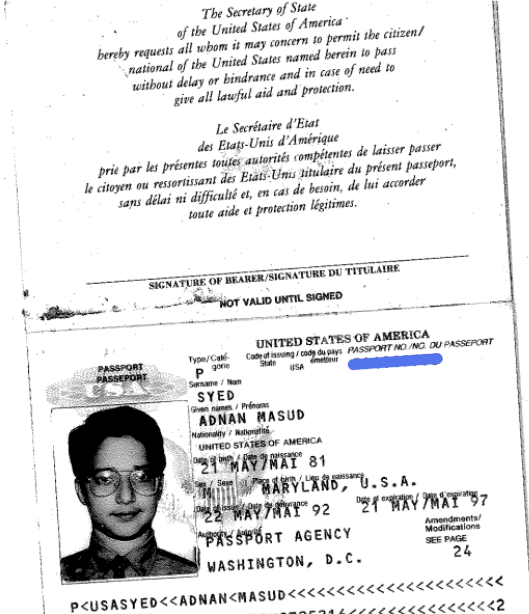 Adnan Masud Syed was born on May 21, 1981 in Baltimore, Maryland. His mother, Shamim Syed, and father, Syed Rahman, are Muslim, of Pakistani background. Adnan has two brothers, Tanveer and Yusuf. In 1999, Syed was an honors student at Woodlawn High School in Baltimore County, Maryland. He was an avid member of the school’s track team. Social and likable, the teen was quite popular at Woodlawn High. Though he came from a strict Muslim household, Syed didn’t always follow all the rules outside of his home life. He was more of a regular teen; he had many friends, smoked weed, attended parties, and even dated (all of which would have been frowned upon by his family). He didn’t cause much trouble in school though. He was a senior at Woodlawn High School, when he met and dated Hae Min Lee. They even went to prom together. Although Lee and Syed cared about each other, they kept their relationship a secret from their parents due to their religious and cultural backgrounds. But after about a year-long relationship, the two called it quits in November 1998. By most reports, there was no bad blood between them. The two reportedly remained friends after the breakup. However, whether or not Syed actually took it well was a focal point of the investigation. In fact, a letter from Lee to Syed after their breakup indicates that he was having a hard time with the end of the relationship. Born in 1980 in South Korea, Hae Min Lee emigrated to America with her mother Youn Wha Kim and brother Young Min Lee. in 1992. They lived with her grandparents in Baltimore County. At the outset of 1999, Lee was an 18-year-old senior at Woodlawn High School. She played varsity field hockey and lacrosse. The teenage girl was also on the boys’ wrestling team. Here’s an interview Lee did with a local news station about her athletic pursuits. More than just an athlete, she was going to graduate with honors in 1999. She was bright, cheerful, and loved by her peers. She also had a part-time job at Lens Crafters at Owings Mills Mall. On January 13, 1999, Lee disappeared. The teen was supposed to pick up her young cousin from kindergarten and bring her straight home, but she never showed. She also did not go to work later that day. Sadly, she was found dead in Baltimore’s Leakin Park on February 9, 1999. A maintenance employee noticed her black hair peeking out of the dirt of a shallow grave. Her cause of death was ruled as manual strangulation. There was some evidence of blunt force trauma to her head as well. Her car was found later in February in an empty lot behind some row homes on the 300 block of Edgewood St.
On the map below, you can see: Woodlawn Park High School (orange) where Lee and Adnan went to school; Leakin Park (yellow), where Lee’s body was found; and the area of 300 Edgewood St. (purple), where Lee’s car was found. Around the time of her death, Lee was reportedly dating a young man named Don, whom she met while working with him at LensCrafters. Don had an alibi for his whereabouts during Lee’s disappearance and claimed to be at a different store location, which was backed by his manager. It was later revealed by Serial that the manager was in fact his mother. Her ex-boyfriend, Syed, was soon arrested for her murder. Through an interpreter on Serial, Lee’s mother said she was surprised to learn that Syed was arrested for her daughter’s murder. She also said she couldn’t forgive him, despite her efforts. Syed has always professed his innocence, even though he’s been convicted of Lee’s murder…and has now already served nearly two decades in prison. Syed was arrested on February 28, 1999. He was charged with first-degree murder, kidnapping, robbery, and false imprisonment. At the time of his trial, he was considered a flight risk by the prosecution, despite his family not having any financial means. He’s also never been to Pakistan; in fact, he never even left the U.S. The case was treated as a crime of passion, pointing to Syed as the main suspect. There were two phone numbers in Syed’s call history of people whom police questioned: Jay Wilds and Jennifer Pusateri. At first, Pusateri just told police Wilds called her that day using Syed’s phone. At a later date, in another interview, she admitted that Wilds told her he’d helped Syed dispose of Lee’s body. When police first interviewed Wilds, he did not mention anything about a murder or cover-up. However, in a later interview, he told them that Syed had organized the entire crime, and had him help cover it up. Wilds’ stories differed when questioned by police officers and there were holes in his recounts of what happened, but he did tell police that he had helped Syed bury Lee’s body and dispose of her car. He kept out of the public eye after his testimony. And that’s what really sealed the deal, it seems; Wilds’ testimony (in return for which he made a plea deal). According to the prosecution (led by Kevin Urick), Syed coordinated to have Lee meet him in a Best Buy parking lot, where he strangled her. He’s said to have moved her body to Leakin Park with the help of his friend Wilds. Adnan Syed was convicted of Hae Min Lee’s murder on February 25, 2000. He was given a life sentence plus 30 years during his conviction. But, to this day, he maintains his innocence. Some say that Syed’s Muslim faith may have been a factor in how his case was handled and in his conviction. But that’s yet to be proven. There are those who believe that Syed is innocent, especially after the release of Serial, a podcast made by American journalist Sarah Koenig that became wildly famous and shed new light on the case. Syed’s defense lawyer was a woman named Cristina Gutierrez. Many argue that she grossly mishandled Syed’s defense. There were crucial pieces of evidence completely looked over in Syed’s case, like a possible alibi that could have made all the difference in his guilty verdict. It was actually the last major trial Gutierrez handled, as she was disbarred in 2001 for allegedly mishandling her clients’ money. Some even believe she botched the case on purpose so that she could get more money for the appeal. She was also dealing with financial and health issues at the time (multiple sclerosis and other ailments). Due to her declining health, Gutierrez never bothered to fight the disbarment. She died of a heart attack in 2004. Syed’s replacement lawyer was Maryland native C. Justin Brown, a partner of Baltimore’s Brown & Nieto. Brown asked for a new trial, arguing that Gutierrez made an important mistake in not contacting a witness who could’ve been an alibi for Syed. Because of this “inadequate assistance” of counsel, Adnan Syed first appealed his case in 2012, but that was denied. The supposed alibi? A fellow student of Syed’s named Asia McClain was apparently with Syed at the library at the same time the prosecution placed him committing Lee’s murder. On May 19, 2015, the Maryland Court of Special Appeals remanded the case to Circuit Court, and the alibi of Asia McClain came to light. In a written affidavit, McClain admitted she was talking to Syed in the library around 2:30 p.m., which was the same time the prosecutor said Syed attacked Lee in the Best Buy parking lot, miles away. It was a crucial piece of evidence that should have never been ignored, and reportedly would have been helpful during his original trial. According to McClain, she wrote two letters to Syed after his arrest and offered to testify, but wasn’t called until 2016. She told the court it was her idea to reach out to Syed in jail. Gutierrez reportedly made notes about McCain’s encounter with Syed at the library, but never followed up on the lead. Unfortunately for Syed, a security guard at the library testified that there were no cameras to support McClain’s claim, and he didn’t remember seeing the suspect either. In 2016, McClain wrote a book about the case titled, Confessions of a Serial Alibi. In it, McClain (who is now married and goes by the last name “Chapman”) made some shocking statements, including admitting that she was a little insulted that her letters to Syed went unanswered. Though she admitted she couldn’t recall the last time she actually saw Lee alive, she still remembers vividly speaking to Syed about her that day in the library. In her book, she even described in eerie detail seeing the ghost of Hae Min Lee in her bedroom. The book, as well as Sarah Koenig’s massively successful Serial podcast, have stirred widespread interest in this case. Now HBO is releasing a new documentary special titled The Case against Adnan Syed. The doc, directed by Academy Award nominee Amy Berg, will be four hours long. Adnan Syed is now 38 years old. He’s been in prison 18 years. He’s currently an inmate at North Branch Correctional Institution in Cumberland, Maryland. In June 2016, Syed’s request for a new trial was granted. But he was denied the request for bail as he awaits the trial date. On March 29, 2018, the Maryland Appeals Court voted to uphold the decision to grant Syed a new trial. Syed’s appeal has been approved by the Court of Special Appeals, but as of May 14, 2018 the prosecution is looking to have the ruling reversed, stating that the new information wouldn’t have changed anything. We look forward to the next step in this intriguing case…and to seeing what new information the documentary may bring to light!